imports1976 has no other items for sale. Sales tax may apply when shipping to: IA*, MN*, MO (8.1%), WA*. Product as described. Had no problems with activating. This is my first experience with Dish Network and I am pleasantly surprised how easy it is to add a portable Antenna/Receiver to my account. I had DIrecTV and they were a nightmare when it came to a portable setup. As for the Wally I am very happy with it so far (I have only used it for a couple of days) It was very easy to setup and the quality is very good. I haven't tried all the fancy stuff yet but it looks like it offers a lot. Great product. Small and easy to carry around. Easy to plug in and follow on-screen instructions. Works for backyard gatherings, tail gaiting and trips with RV. You will not get recordings with this product. I now own 2 of these and love the new interface with built in Netflix it’s simple to setup and easy to use. 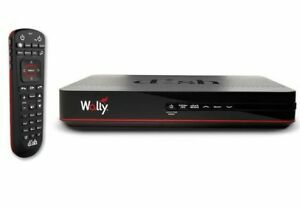 With the one time $40 DVR fee both of my Wally’s have DVR feature with attached hd which is all I need for my home and RV. Highly recommend if all you need is a single tuner and no need for the $15 a month additional DVR fee dish charges then this is for you. My old receiver went out and I got this one, just a call to add the new receiver to my Dish account and add smart card and I was up and running, everything is working well and it was super simple. Easy to install and works great with the Dish Tailgater satellite system.